Wisconsin School Music Association offers a music list of more than 6,000 carefully selected titles to promote musical growth through practice, performance, and evaluation at WSMA-sanctioned music festivals. Wisconsin teachers annually volunteer many hours to review and recommend music for this list in collaboration with WSMA staff. If you are interested in serving on the music list selection panel, please submit an application. The music list is published no later then the week of Labor Day each year. It is published as soon as it is completed, so early access to the list is not possible. – For the past several years the music list has been published early – around August 15. 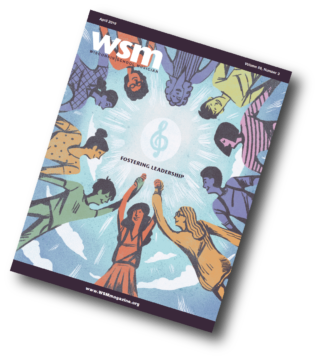 The Festival Music List is available to teachers at current WSMA member schools as a member benefit through their MyCenter account. Students and parents should work with their music teacher to view and select appropriate music from the festival music list. The Festival Music List is available to current adjudicators through their MyCenter account. Active adjudicators without a MyCenter account should contact Victoria Donahue for login access. Access for non-member organizations is available through Non-Member Subscription Services. What will be changing on the list? Are you a publisher interested in submitting music? Visit our Information for Publishers page to find out details on timeline, contact information, etc. 1. When will the new list be available? The Festival Music List is published as soon as the edits are complete. Typically this is mid-August, but no later than the week of Labor Day. 2. Can I get early access? Please? 3. Which lists have major changes this year?